Has your child increased their activity recently and are complaining of a few aches and pains in their heel? If the answer is yes, they may be experiencing a common bone condition in kids called “Sever’s Disease”. Sever’s Disease, also known as calcaneal apophysitis is a painful injury resulting from inflammation at the growth plate within children’s heels. Sever’s generally affects kids around the age of 8-14 years and is most common with those who are overly active. Growth spurts in kids can make their bones grow faster than the muscles and tendons attached to them. 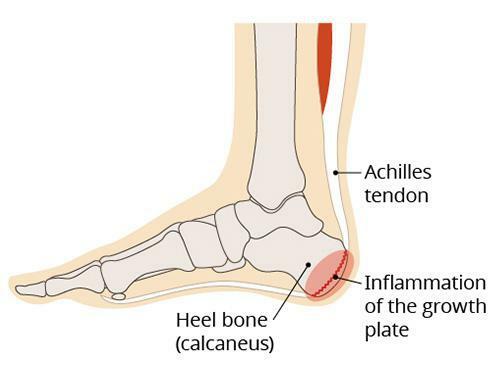 In the case of Sever’s, tension in the Achilles tendon pulls on the back of the heel causing inflammation and pain. Whilst a sharp increase in activity can trigger the pain, high levels of activity can aggravate the symptoms further. Sever’s Disease Symptoms – What should you look for? Your child will complain of pain at one or both heels when partaking in sports. The pain is likely to increase during activity, ache afterwards and improve when rested. Occasionally you may see your child limping or walking differently when they are playing. Sever’s Disease Treatment – What can you do to help? If your child is complaining of a sore heel; icing, elevating and resting the foot is the first port of call. Reducing the frequency of their activity through the week or substituting some of their running based activity with more of a low-impact one, such as swimming, is a wise option. Footwear may also be a consideration; are their shoes appropriate for the activity partaken? If rest, changing activity and addressing footwear haven’t shown a great improvement in symptoms, it is worth getting in touch with your podiatrist. Up and Running Podiatry are experts at diagnosing and treating heel pain in kids. Our treatments may include stretching and strengthening exercises, footwear advice and orthotics. If your child is suffering from heel pain and needs some help, head over directly to our Online Bookings or check our Up & Running Podiatry Clinics to make an appointment with one of our team today.